Come and join us for Kickback With Intention! We’ll be having a chill evening, featuring music, games, and KARAOKE! This will be a great opportunity for networking and connecting with friends! Join us as we celebrate our 2 year anniversary! We have so much in store including outdoor games, music, food and ice cream trucks, and good vibes! This event is for ALL ages! AND… the event is completely FREE! Bring your friends and family and enjoy a day With Intention! Join us for an event filled with networking in support of Black Entrepreneurship. Bring your business cards and be ready to mingle with entrepreneurs to learn tips and make new connections. Brunch buffet and bottomless mimosas! Come out to our 2nd Annual Game Night With Intention, being held at The Suite Spot in Livingston, NJ August 26th! Game Night With Intention is a networking event that will feature all types of games and music as well as free food and drinks. Bring a friend and a donation of a school supply and experience the good vibes! School supplies will be donated to Camden Street School in Newark, NJ! 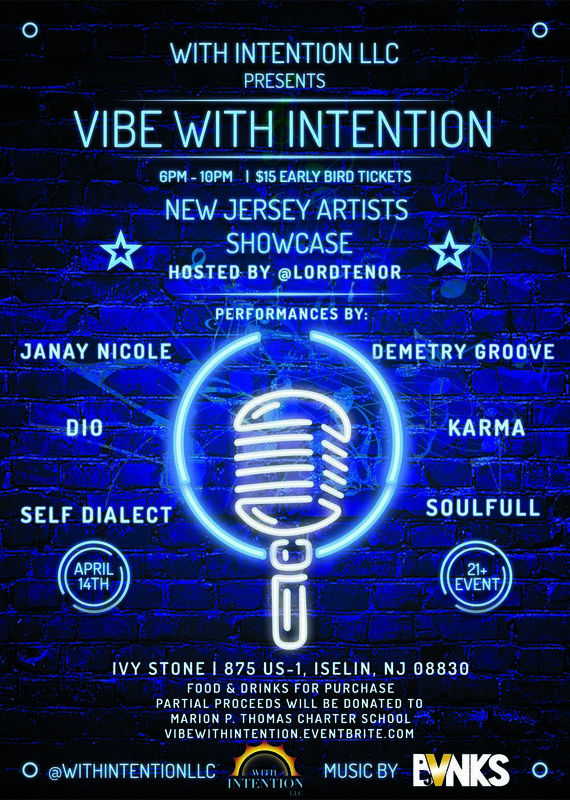 Vibe With Intention is a networking event that will showcase performing artists from all over New Jersey. Come out to enjoy live music, dancing, and mingling with friends! Located at Ivy Stone Bar & Lounge; food and drinks will be available for purchase. A portion of the proceeds will go to the newly formed Performing Arts program at Marion P. Thomas Charter School in Newark, NJ. Come out and VIBE with us for a good cause! Hosted by Lord Tenor and music by DJ Bvnks. The event is 21+. Find out what With Intention is all about as we gather for a night filled with games, music, and networking! There will be a cash bar on site, and complimentary appetizers and snacks will be served. Oh, did we mention there will be prizes and giveaways? !